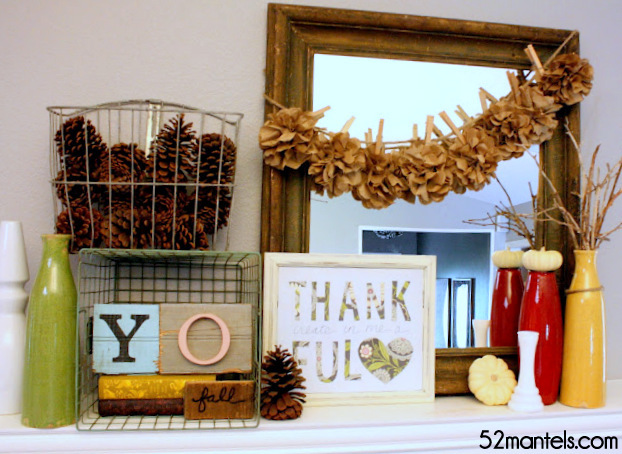 52 Mantels: Yo, Fall. 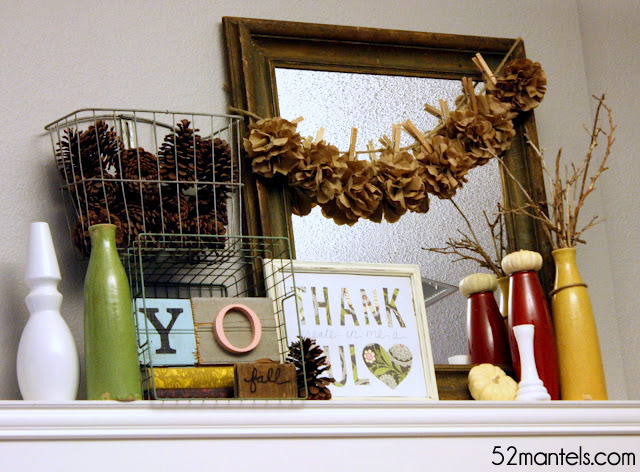 It's Mantel Time. Yo, Fall. It's Mantel Time. I can't believe it's the week of Thanksgiving! Time flies by in a blink of mantels, doesn't it? I have so much to be thankful for and this time of year is perfect for reflection. I didn't participate in the 30 Thankful Days movement, but if I had to place all 30 days of thanksgiving into a single thought, I would say this: I am thankful to be His beloved. Because that simple truth is the genesis of every other truth in my life. I made my simple paper art in about 3 minutes and afterwards thought well, golly E, that would have been a great tutorial to share. Sure wish you'd have taken pictures. Okay, so I don't really call myself E and I don't really have 3rd person conversations with myself. But, if I did, that's how it would go. One could assume, at least. But, alas, I have no photographs to show you. Perhaps I can just explain it: cut out words and a single heart shape. glue them to a piece of plain cardstock. 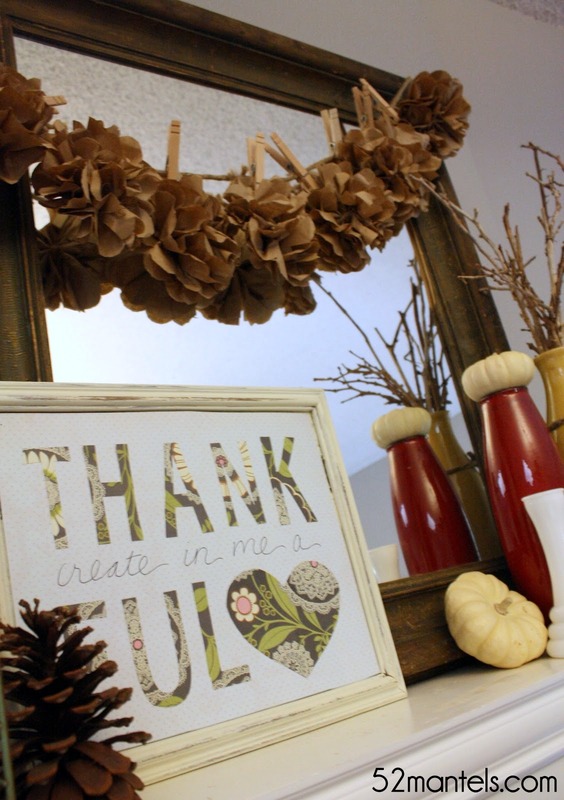 handwrite "create in me a" to go with your "Thankful <3". step back and admire. That wasn't so bad, was it?? I got these letter scraps for $2 each at First Monday Canton Trade Days. I'll let you in on a bitty secret: the reverse side of the "fall" block has on it a cute letter j. 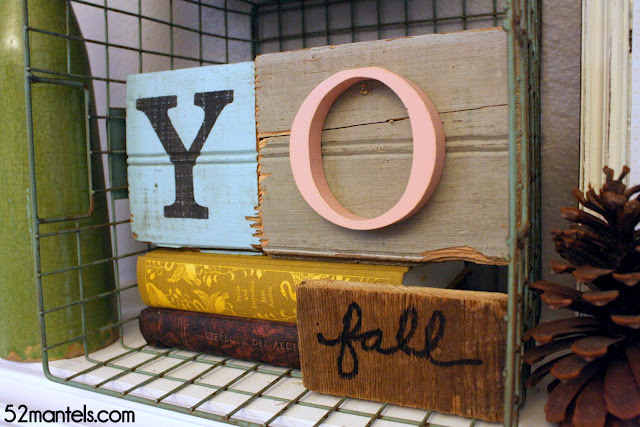 So, no, I didn't buy letters to spell out the word YO. I bought letters to spell out Joy. But, I really liked how YO fit perfectly inside my metal basket, so I went with it. Sometimes there's a method to my madness and sometimes it's just madness. 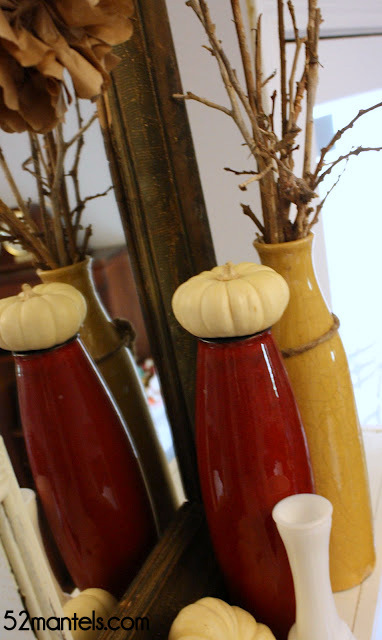 Vases, sticks, pumpkins. You know the drill. That top basket full o' pinecones was my dad's childhood bike basket. I love it with a love not typically given to bike baskets. When I took it from my parents garage, I used it to carry home some pinecones, also found in their garage (what don't they have in their garage??) . And, I will tell you that those pinecones have yet to leave that basket. They're just so very happy together, I couldn't possibly separate them. Until Spring, that is. In Spring those cones will be evicted. Because, I'm tough like that. Well, looky there, I'm using those lunch bag flowers again. You know once I make something, I stick with it. For. Ev. Er. I'm already plotting how I'm going to work these into my Christmas decor. Let's be honest, it won't be hard. Happy, Thankful Thanksgiving, friends! I'll try to get a Christmas mantel together ASAP for next Monday. While I just LOVE your amazing fall decor....I CAN'T WAIT FOR THE CHRISTMAS POSTS!! Love the metal baskets! Will be keeping my eyes out for that on my next antique outing! Oh - and trying the paper flowers this week for Thanksgiving decor. Will let you know how it goes. I forget how well you write. Reminds me of Africa.....I look just as forward to your posts to hear what you say. Since I know you so well....I laugh out loud. Ok...maybe it isn't quite as impacting as running a clinic in Sudan and hearing about birthing babies in the bush...but....you know what I mean. Love that you are clearing out my garage, by the way. I love every last detail! You'll have to publish your 52 mantles at the end of the year! It will be a best seller FOR SURE!!! Hope you're having a great week leading up to Thanksgiving!!! If there are signs or flashing lights stating to walk your bike please obey, it will help ensure your safety and the safety of others around you.